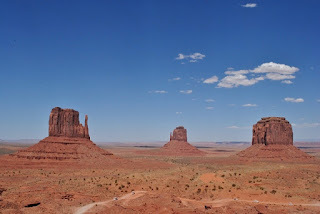 The Colorado Plateau of northern Arizona and southern Utah is one of the most striking regions of North America. It combines one of the lowest numbers of human inhabitants per square mile with one of the highest numbers of national parks and monuments , including the Grand Canyon, Zion, Bryce, and Arches. I remember the slides taken of our family visiting these strange, exotic places when I was a child, beyond the reach of actual memory yet always present to my imagination. In anticipation of a return, and for the sake of friends who may ask us about a Grand Tour, I will outline below a circle path one might follow to gain a holistic sense of the Colorado Plateau. Several weeks would be needed; on our brief trip, we did not visit every site and in no place did we linger long enough. My Grand Tour begins in NE Arizona on the way to Phoenix, but one could begin the circular itinerary at any point. There are many ways to experience new country. To travel with a fisherman, one experiences new country primarily alongside its rivers and lakes. Traveling with a hiker or cyclist involves seeking out the bicycle trails and footpaths. Compared with hiking or cycling, the view from the back of a horse has its own distinctive rhythm, adding the responsibility of caring for a living and breathing fellow traveling companion. If the friend is not a horse but a pilot, one views the country from overhead, with a wide angle. To travel with a reader or movie-goer requires quiet, unhurried time to experience literary and cinematic works in situ. These ways and others are fun and enlightening, so search out opportunities for a wide variety of perspectives. 1. 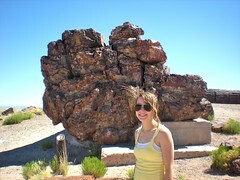 Petrified Forest , Painted Desert National Parks, AZ. An audio tour is available in the Visitor Center gift shops. 2. Mogollon Rim – the south boundary of the Colorado Plateau. From the Petrified Forest go south, following State Highways 377 to Heber, 270 to Payson, and 87 to Phoenix. 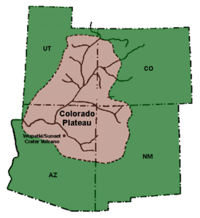 One could actually fall off the Colorado Plateau over the steep Mogollon Rim . Keep those roadside guides handy. We gathered at A.T. Still University in Mesa (cf. Laura’s post). 3. Grand Canyon National Park , AZ (USGS ). 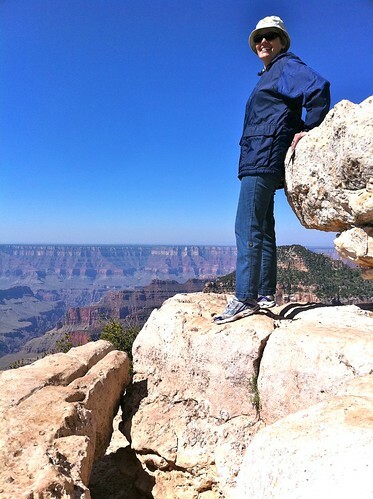 We visited the North Rim this time, which was definitely worth the extra driving time. The drive north of Flagstaff on US-89 through Navajo land along the Echo cliffs takes one through the northwestern tip of the painted desert. 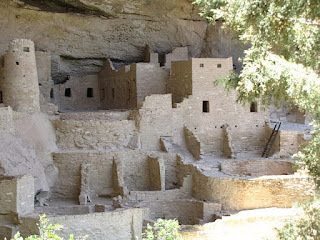 This drive is a singularly striking introduction to the desert country and superbly exemplifies the Colorado Plateau. When you turn westward along the Vermillion Cliffs south of Page toward the North Rim, the view of the Kaibab Plateau is striking. The Kaibab Plateau is an island of alpine forest rising above the surrounding desert which laps at its shores, while the Grand Canyon cuts the south side. We stayed at Jacob’s Lake Inn , which is excellent, although next time we’ll try for a National Park cabin right on the North Rim. Candace and I laughed our way through a hilarious account of a mule-ride into the Grand Canyon by Donald Davis. Listen to The Grand Canyon – Donald Davis. It’s a hoot. 4. Page, AZ (at least a full day): Horseshoe Bend , Antelope Canyon , Glen Canyon Dam and Lake Powell (USGS ). One of the high points of the trip for me was the moment a Navajo guide walked through Antelope Canyon playing his Navajo flute. Surrounded by windswept ancient sand-dunes fossilized into this stunning slot canyon, it just seemed appropriate to pause to listen to the wind of his breath passing through the desert flute. One of my favorite souvenirs of the trip is the CD Radiant Sky by Scott August, which features a Navajo flute. 5. Zion National Park , UT (USGS ). The drive from Page, AZ to Springdale, UT, is again spectacular. Keep those roadside guides handy. We stayed at the Bumbleberry Inn in Springdale. The Wayside Tours and Patricia Lawrence audio guides to Zion were helpful (we listened to them on the way), as was riding the shuttle from the Visitor’s Center to the end of the line to get our bearings. Laura and Marvin and family, who stayed at Zion Lodge , got to do this on a late Moonlight Ride, an ideal way to let Zion introduce itself. Zion Canyon is distinguished by its near vertical walls which create a massive grandeur. Truly awesome. 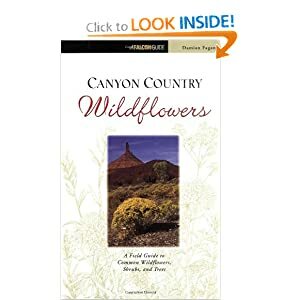 Although Zion is in desert country, due to the Virgin River and the seeping rocks and springs, inside the canyon the vegetation can be surprisingly lush. Rachel commented that the descent into Zion as we arrived reminded her of Rivendell . Warm up the first day with brief walks to the Emerald Pools, Weeping Rock (my favorite), and the lush riverside walk from Sinawava Temple, where we watched a California Condor soar overhead – an unforgettable sight. If more ambitious, on later days hike the Canyon Overlook Trail, wade through the Narrows, and climb Angel’s Landing. Plan ahead for these: come prepared with proper footwear, water bottle, hat, sunscreen, sunglasses, energy snacks and other gear. Next time we’re going to try out walking poles to keep us from turning an ankle on the softball-sized rounded rocks that cover the bed of the Virgin River, and we’ll come with hiking boots that offer strong ankle support and good traction on wet surfaces. And we won’t forget the binoculars . We could spend a week in Zion without batting an eye. Before leaving, don’t miss the unusually beautiful Kolob Canyons area in northwest Zion. The Kolob Canyon area also affords a dramatic view of the western edge of the Colorado Plateau. Kolob Canyons are on the way to the spectacular State Highway 14, which runs along the north side of Zion through Dixie National Forest and affords a glimpse of Zion Canyon from above. The extensive lava flows are a remarkable sight, distributed among aspen and pine forests, with plenty of snowfall remaining on the ground. What a total about-face from the heat of the desert below. Laura particularly enjoyed the signs saying “8% grade” or “No stopping or standing next 2 miles due to falling rocks” as well as the ones that had so many s-shaped squiggles they would tie a snake in knots. In one place the lane turned to gravel where a landslide must have knocked it out this past winter. But the view was well worth it! Next time we’ll also check out Cedar Breaks National Monument . 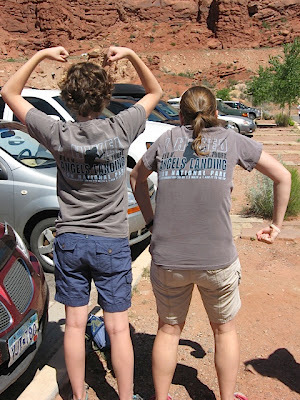 Plan on a full day to travel from Springdale through Kolob Canyon and Hwy 14 to Bryce. 6. Bryce Canyon National Park , UT. Among canyons in the desert southwest, Bryce stands out for its varied colors and delicate structures. The Grand Canyon might as well be infinite for the way its immensity plays tricks upon sensory perception. Zion’s massive verticality is an awesome Romanesque cathedral. Bryce, in comparison, appears less imposing, more comprehensible. We caught Sunset Point at sunset. Beautiful. On the way out, we gave a lift to Michelle and Marie-Claire, from Orléans, France, who had missed the last shuttle back to their hotel. Although National Parks inevitably are crowded tourist destinations (campgrounds and hotels require advance reservations), one of the compensating joys is the number of languages one hears spoken in them. We were thrilled to meet this wonderful French couple and have the chance to talk with them for a while. Likewise in Zion, within a blind arch carved away behind a waterfall, we were treated to the echo-producing yodels of a Swiss man who was traveling with Hebrew-speaking companions from Israel. What a small world, indeed. Trails below the rim open up another world. 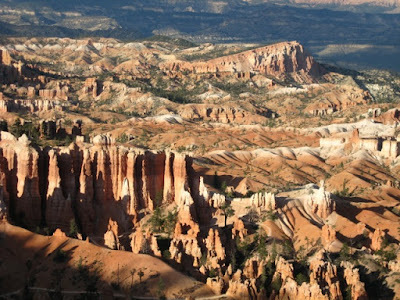 An early settler remarked that Bryce is “a hell of a place to lose a cow.” Be careful and save your strength when hiking: after seeing what you go afoot to see, the only way home is up. “As you approach Boulder, there is an incredible section where the road goes along the top of a ‘backbone’. Pull off the road somewhere on this section for fantastic Grand Staircase vistas. A few miles out of Boulder, going NE, the road rises as it goes along the southern flank of Boulder Mtn. Again, don’t fail to pull off at the scenic points (marked) for incredible vistas. A little farther along, as the highway turns north toward Torrey, the pull-outs offer great views over the Waterpocket Fold and Capitol Reef; and the Henry Mtns beyond (famous as where GK Gilbert found out about laccoliths). Perhaps you will be in too much haste to do this side trip out of Boulder – but it is a beaut: It’s called the Burr Trail road . Just where highway 12 takes a bend, in town, from eastward to northward, the Burr Trail road continuing to head east takes you through some wonderful Grand Staircase type of country – the exposed rock here is quite a sight. You can visit a modest slot canyon right by the road, about a dozen or so miles in (I think – I cannot recall exact mileages), but even if you only go four or five miles down Burr Trail road before turning around, the sights of rock are quite fine. At Boulder, by the way, the Hell’s Backbone Grill is actually an outstanding place to eat. Located just N of where highway 12 bends northward in the middle of (tiny) Boulder. 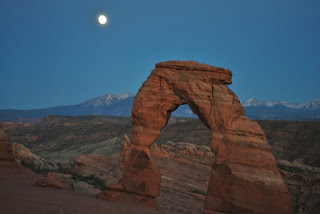 Capitol Reef is quite interesting – worth a short visit, which involves a drive south into the park from the highway (no. 24 at this point) a few miles – you don’t have to go in terribly far to get an idea of the place. Even if you don’t go into the park, at the old Gifford Farm House close by the visitor center and campground they sell fresh-baked mini-pies in various versions (apple, rhubarb, blackberry, etc) that are to die for, especially with some vanilla ice cream on top. 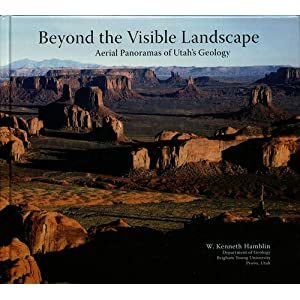 Keep that roadside geology guide handy, even on I-70 where the roadcuts and panoramas are astonishing. At Green River, stop at the John Wesley Powell River History Museum , where after we had gone on down the road following a picnic lunch, a kind worker fished my daughter’s retainer out of the trash and saved it for us. There must be a special circle of heavenly joy awaiting those who assist hapless travelers on their way. As you head south, admire the La Sal mountains to the east. 12. Canyon de Chelly National Monument , AZ (USGS ). From here, it’s a quick trip down US-191 to I-70 to complete the grand circle tour. See our photo gallery . Now I’m ready to read some Louis L’Amours and watch some old westerns. 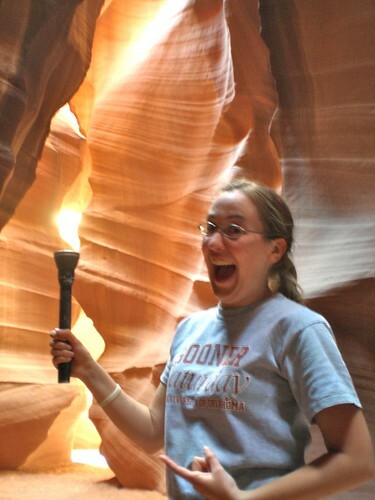 Thanks, Laura, for YOUR posts on the trip! And for the photos! (Give Jackson my compliments; I want to see them all.) Thanks especially for traveling with us – seeing all these sights with your family made it much more fun. 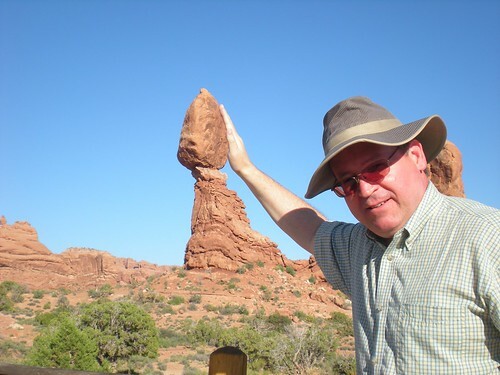 BTW, what was the book Marvin has on the movies of Arches and Monument Valley? I’d like to insert a link to that in the post.